Let's begin with the current winter weather weather watches and advisories. Orange = blizzard warnings. 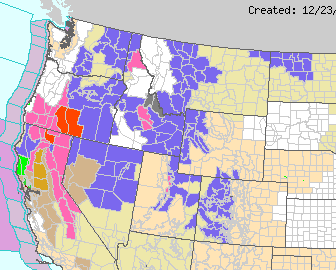 Pink is blizzard warnings. Blue is winter weather advisory. The winter storm has finally crossed the coast of Washington and Oregon. The morning flights to Hawaii departed Seattle, Portland, and San Francisco. Those planes generally carry weather instruments to sample the west side of the storm for the noon computer model run. So, this forecast will heavily lean on that data. The last two runs of the North American Model have portrayed a major winter storm from the southern Plains into the Midwest. 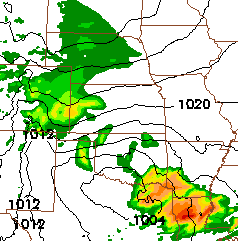 I'm going to show both the version from the 6am model and the noon model. 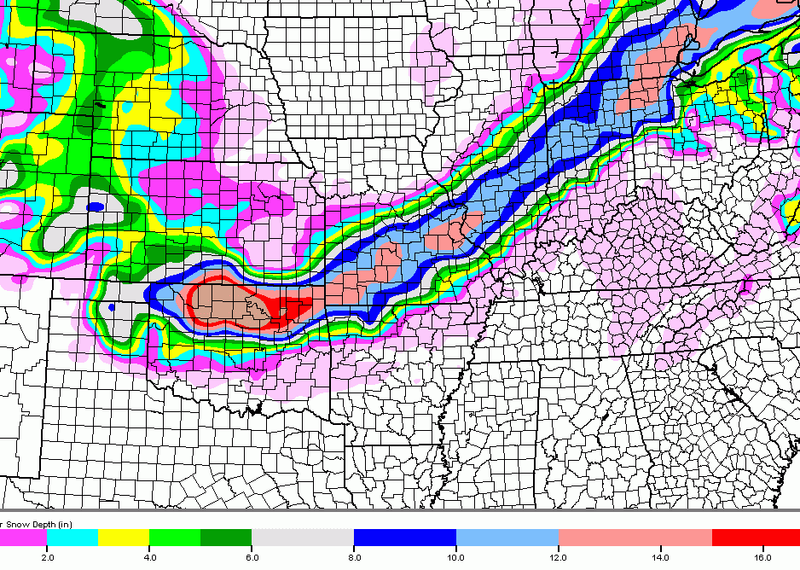 Very heavy snows are forecast from the west and north suburbs of Oklahoma City through Tulsa to about Springfield, MO. There is another dot of very heavy snow in the far southwest St. Louis suburbs and a third near Detroit. The geographic area of the snow band is quite consistent from the earlier version but there are important differences. The heaviest snow in Oklahoma is farther west and north. The total snow amounts from the Ozarks on east is less (but still quite heavy). Winds over southern Kansas and northern Oklahoma are gusting to 30, maybe 35 mph. This will cause blowing and drifting snow. 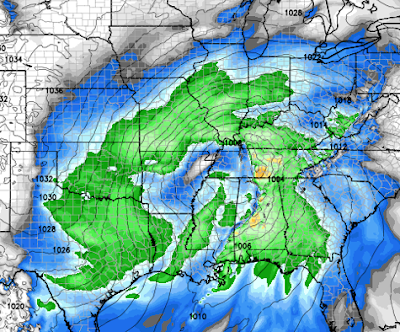 Wind gusts to 30 to perhaps 40 mph are accompanying the heavy snow from the Ozarks to Illinois. 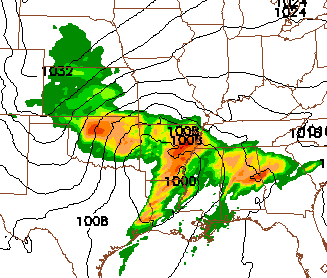 Also, the model clearly shows damaging winds with thunderstorms from central Tennessee to southern Mississippi at that time. I'm using my home county (Sedgwick) to illustrate what meteorologists often face in snow amount forecasting. Look at the predicted range of snow amounts across our county. The violet in the northeast part of the county is two inches. The light blue in the southwest corner of the county is 14"! Our tools have little ability to resolve these amounts to within 20 miles with the storm still 36-40 hours away. So, we'll end up giving a wide range until we get a little closer to the start of the storm. Bottom line: This is a major winter storm in a part of the world where the highway snow removal equipment is not as extensive as farther north. I urge you to consider this forecast in your travel plans. Addition: 5:12pm. 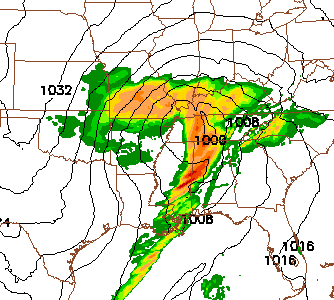 Got an email pointing out the noon run of the GFS model is about 30-40 miles farther south in Missouri and Illinois than the forecasts above. That is certainly a possible outcome. I want to keep emphasizing that -- at this point -- these are the approximate paths of the storm. Mike it seems the weather service in Springfield ,MO (as of my comment) is leaning towards the GFS solution. 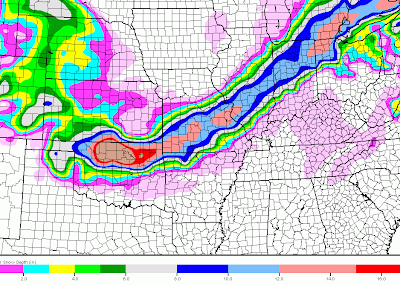 I thought extreme SW MO would beunder the gun, but apparently not so. 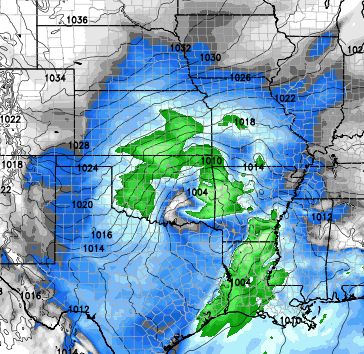 The NAM did better on the recent Denver to Green Bay storm and has consistently called for a major storm. So, that is why I'm basing my forecast on it. See new posting at top of blog with Christmas 9pm "snapshot." Sure will. Thank for your expertise.